After six months as the Vice Chancellor of Anambra State University, even the doubting Thomasses have come to terms with the fact that indeed, a Daniel has come to judgment. His policies and actions within this period has indeed shown that he is a round peg in a round hole. ANSU News brings to you the man, Prof Fidelis Uzochukwu Okafor his antecedents, his vision and achievements in the University barely six months in the saddle. So, when Prof. Okafor was appointed the Acting Vice Chancellor, the questions on the lips of most of the people were: “Is he the Messiah?,” “Can he carve on a rotten wood?” since in the views of most people, the situation had gone so bad that it takes a man with a magic wand to salvage. However, to the Professor of Philosophy, those who followed his activities from University of Nigeria, Nsukka and the College of Education, Nsugbe where he went on a rescue mission and actually conquered, believe his appointment will turn a new leaf in the annals of Anambra State University. They have their reasons. 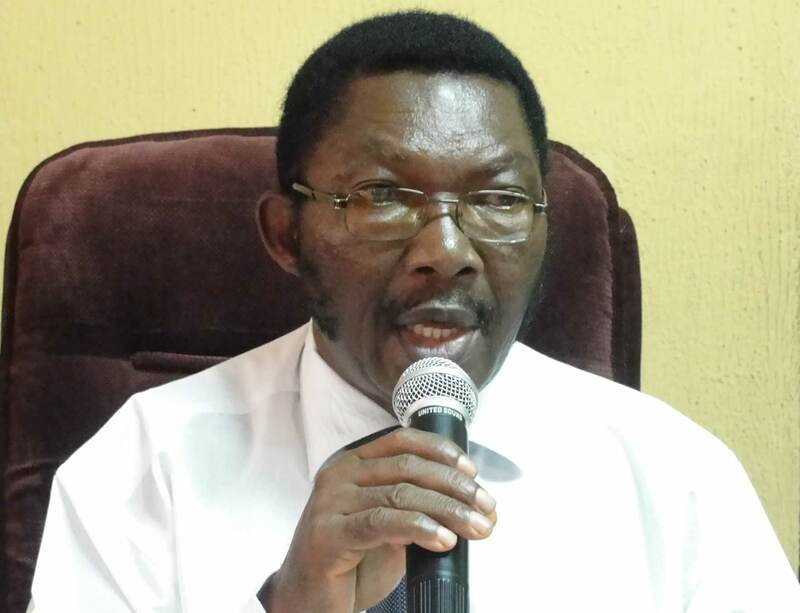 At least, the situation at Anambra State University cannot in any way be compared to events at Nwafor Orizu College of Education, Nsugbe when Prof. Okafor was “pulled” from the University of Nigeria, Nsukka to rescue the situation. And, he actually did. When Prof. Okafor was appointed the provost of College of Education, Nsugbe in 2007, the academic institution was, to say the least, boiling. Hostility was rife between different unions, the management and the governing council, and even the student body. This situation gave rise to all kinds of petitions, press war and litigations. Professor Okafor’s appointment as the Provost of the institution was the balm that soothes frayed nerves. It was a period of reconciliation that eventually saw all the aggrieved parties embracing each other for the growth of the institution. That was not all. Prof. Okafor, as a seasoned academic and administrator which he is introduced a season of leadership by example. His dedication to work, transparency, prudent management of the lean resources, team work, reward for excellence and the drive to excel brought in an era of academic advancement and infrastructural development in the institution that it became a reference point. So, when he was appointed the Vice Chancellor of the State owned University which was then drifting towards the unknown, people received it with mixed feelings and tongues were wagging. To students and staff of the College of Education, Nsugbe, it was a sigh of relief cut short. How can the man who has done so well for the institution be reassigned within a short period of time? What will be the fate of the institution thereafter? But, he who wears the shoe, knows where it pinches. The state government needed his services where it matters most. Things fell apart at the State owned university and it was time to call an old war horse who would match words with action. That is a man who has an impeccable track record. A man who has been tested and trusted. A man who many say, has the magic wand, therefore, can move mountains. A man who has all it takes to change the face of the university which 10 years after its establishment, has remained just a dream; and as some critics would say, a glorified secondary school. Matters became worse with the six-month industrial action in the institution which led to a decay of the already existing but insufficient infrastructure, brain drain and dwindling morale on the part of the workers. Call it a miracle, breaking the jinx or having a magic wand, how it happened remains a mystery to the staff, students, parents and all other stakeholders in the university. Just 24 hours after his appointment, Prof Okafor held series of meetings with all the people involved in the six-month old strike. And, surprisingly, that meetings became the balm that soothe frayed nerves. Before people knew what was happening, agreement was reached in all the issues which other stakeholders were unable to resolve. This agreement later got the seal of the governing council. As a leader of one of the striking unions put it, “We did not know how it happened. The agreement which we drafted with the Vice Chancellor is better that all the agreements that were thrown away by the Council. No one can actually say what happened. To us, it was a miracle.” That first bold step indeed endeared the Vice Chancellor to the heart of many people including the union leaders. In an interaction with ANSU News, a union leader said that the lesson of that action was that Prof. Okafor has immense respect from people and can stamp his feet in defense of the University. This attribute, the union leader said, made him the ideal man at this stage of the university’s development. With the strike over, both students and staff returned to the campuses to continue where they stopped. But, as expected, that was a period of mistrust, mutual suspicious and grumbling especially when there was a slight increase in school fees. The students, with the parents pulled the sword in clamour for the reduction in school fees and the staff hell bent on the payment of the outstanding arrears of salaries. It was another crisis situation which needed the service of a crisis manager. Prof. Okafor brought his experience to bear in this. He embarked on an interactive sessions with the students, staff and parents. In these interactive sessions, he was able to convince the parents and students of the need for the increase in school fees that all went home satisfied, with the reasons and explanations for the increase, pledging to do everything that will lead to the growth of the university. Since assumption of office, the Vice Chancellor has shown that the students are the most important public of the university. He embarked on massive rehabilitation of students’ hostels and the furnishing of the common rooms. Presently, the hostels wear a new look with the tiling of the common rooms and the provision of DSTV services for the hostels. As some of the students said, “the hostels are now habitable and conducive for the students chores and relaxation after the lecture periods” Since the world has become a global village, the DSTV also provide the students with information about the world that they can comfortably fit into the system. He is not concerned about only the students living in the hostels, even those living off-campus had a share of his fatherly role. Worried by the high rate of rents paid by students living within the Uli and Igbariam communities, the Vice Chancellor recently had an interactive session with landlords where he appealed to them to reduce the rent paid by students and waive the six months rent arrears accumulated during the strike. Interestingly, some of the landlords heed to this appeal. Today, the students are happy. Since the past three years, both the Uli and Igbariam Campuses of the University had been without power supply due to accumulated NEPA bill. All efforts made to reconnect the campuses to the public power supply failed due to reasons that could not be explained. Despite the financial implication of this situation, its effect on the workers and students are better imagined. In fact, it led to low productivity as workers hardly stay for long in the offices. And, those who manage to stay can hardly achieve much due to the absence of power. Today, the situation is different. What earlier seems impossible is now possible. Both the Uli and Igbariam campuses of the university had been reconnected to the public power supply with the payment of the outstanding NEPA bills and the refurbishing of the transformers. This has enhanced the period workers especially lecturers stay in their offices and their productivity. Immediately after the strike, workers were agitating for the payment of their outstanding arrears of salaries. However, the Vice Chancellor surprised everyone by showing them that he need not be reminded of what is due to any worker once he has the resources. Without waiting for the time the workers will chant Aluta Continua, he paid the 2009 promotion areas. This, the workers say, made him outstanding. In industrial relations, one of the major things that always lead to crisis is the inability to honour agreements whether at federal level, state, local government etc, the situation remains the same. So, when the unions at Anambra State University signed an agreement with the Council and the Vice Chancellor wrote an undertaking, people remained skeptical. The question remains: Will they honour it? But, Prof. Okafor has shown that he is a man of integrity, a man of his words and a man to be trusted. He did not wait for a reminder before implementing the promise which he made that the new salary regime will take off from February 2011. This earned him the trust and confidence of the different unions on campus. In most cases, the condition under which the Vice-Chancellor was appointed would have been one that will breed ill-feelings and rancour. But in Anambra State University, the situation is different. The fatherly disposition of Prof. Okafor is the balm that soothes frayed nerves. Today, the Vice Chancellor has a good working relationship with his predecessors and all the trade unions on campus. Not long ago, some of the principal officers and the management team, in company of the Vice-Chancellor paid a “thank you” visit to the College of Education, Nsugbe. The visit, observers say, was to “thank” the institution for giving them the man Prof. Okafor. Anambra State University may have achieved a lot in academic activities, but its environment leaves many questions in the minds of visitors and other stakeholders. The question has always been: if there is no money to erect new or modern buildings, can’t the existing ones be taken care of? What happens to the weeds taking over the places and unsanitary condition of the hostels, classrooms and the entire environment. Before now, these problems seem to be insurmountable. But, Prof. Okafor has shown that making the two campuses habitable is not a big deal. Immediately he assumed office, he set up the Environmental, Sanitation and landscaping Committee charged with the responsibility of making the entire environment habitable. This is the kind of Committee he chaired while at the University of Nigeria, Nsukka. Today, the story is different. Only a visit to any of the two campuses will tell the story. It is a story of total transformation. As is always said, God is the beginning and the end, the Alpha and Omega, and without him, man labours in vain. Prof. Okafor has an abiding faith in these and puts God first in everything he does. He started his activities in the University with an inter-denominational service to seek the face of the Lord. And, many will agree that the university has indeed found the face of the Lord looking at the turn of events. The 2010/2011 unified matriculation ceremonies which people said, remains the best of its kind since the university came into being were heralded with inter-denominational services. There, the officiating priests prayed for God’s intervention in the problems confronting the university. Today, it seems, the prayers have been answered. In different institutions of higher learning, academic vices and all other unethical practices derail the institutions from achieving the desired objective. Anambra State University is not an exception, vices of different forms and shapes abound. So, when he assumed office, Prof Okafor knew that no meaningful development would take place if those vices were allowed to continue unchecked. To check these vices, he appointed an eleven-member malpractice committee charged, among other things to monitor, investigate and report different forms of vices existing in the university to the management. Students were also encouraged to report those vices without fear of molestation. Presently, the committee is investigating some academic and non academic members of staff who were found wanting in the discharge of their duties, a situation that has reduced the existence of such vices. Before now the works department was full of broken down vehicles which many call “unserviceable” vehicles. While these vehicles were there, different units of the university were clamoring for the purchase of new vehicles for use, a situation which the lean resources of the university could not accommodate. On assumption of office, the vice-chancellor took stock of all these “unserviceable” vehicles, serviced them and distributed them to different units of the University for Use. These vehicles are now administration when the need arises. We had difficulty dealing with these discussions during the strike mostly about the process of raising the fund with which to sustain the university. Our argument has always been that Anambra State government should take a stand about funding the university. The reliance on schools fees for the payment of salaries is not a good one for the life of the university. The much we can do as a union is that when the management makes a policy on the collection of school fees and we are asked to make sure that people that come for exams or lectures come with their school fee receipts. The academic staff will easily obey such directives because it is not against whatever principle we stand for. But, obviously, we cannot run the school for them. We cannot. If they need the union to be part of the drive to raise money, individual members of the union has always been the bedrock upon which the university has always operated and will always continue to give that support. In a 100 per cent scale, where will you place the new Vice Chancellor? In a 100 per cent scale? Well, if I use that to rate him, I will even be under-rating him. Let me begin by saying that with the arrears of the 2009 promotion which was paid, I rate him very high. With the consideration and implementation of the February salary as we entered in the agreement, I see him as a man of his words. In anticipation that 2010 promotion which is being delayed because of the strike and the proper constitution of the council now that the council is going to sit with the new senate representatives, and is going to speed up action on that, I will rate him higher when that is done. I also urge him to also ensure that the 2011 promotion is out on or before the first of October. Generally, I think he is a man of his words, a man of honour and a man that also understands that the staff should be given enough to sustain the system. Tell us one particular issue that endeared the Vice Chancellor to your heart. I will take it from the day he was addressing the students. He said something that was very touchy. He reminded the students that they are protesting against an increase in school fees when the lecturers teaching them are in arrears of four months of their salary and that these lecturers are people that can move at any moment of the day. It made me to see in a man who understands our problems and who wants to solve our problems. He is somebody who has the interest of the staff at heart and who also understands what the university should look like; who is making effort to make this university to a place worth working in. This is the basic thing that is of interest to me. At least, I am beginning to feel I am a university lecturer. He takes interest in little things and those little things matters a lot. As ASUU Chairman, what is your advice to the staff and students to ensure that things work well in the university? I will begin by advising the government and not the staff and the students. If the government is doing what it is supposed to do, the staff will not do anything to destabilize the system. The government should live up to expectation. The government should live up to the agreement which was entered on its behalf by the council. To our colleagues, I say patience. Patience is still important but then, the system has to understand that the man who is patient has his children in this school and other schools and needs to pay his house rent and the landlord may not be patient with him. He also has to pay his bills, put his car on the road and take care of his family.